“So. Do you wear sunscreen?” my second dermatologist asked during our first appointment, some 15 years ago. This dermatologist never discussed UV at all with me. (I’d grossly underestimated in speaking with him the number of burns I suffered as a child + as a teen, but to his credit, he surmised this.) He never explained that all my burns meant that I had been exposed to much more UVA, which causes long term damage + cancer. He never said I should wear SPF every day, indoors + out of doors, and never talked about UVA + UVB, just about my burns + my risk. According to him, I was + still am, doomed + only time will tell if his prognosis will come true. My response to the doom + gloom was to start investing in SPF rated hats + clothing + commence to wearing them whilst toiling in the garden or wandering around a street festival. When I was seeing this dermatologist, I had in fact, not had a sunburn in years. I followed the commonly held advice to stay out of the sun between 10 a.m. and 2 p.m. (now it’s 9 a.m. to 4 p.m.) I exercised outside in the early mornings + late afternoon light, when the sun was low in the sky. 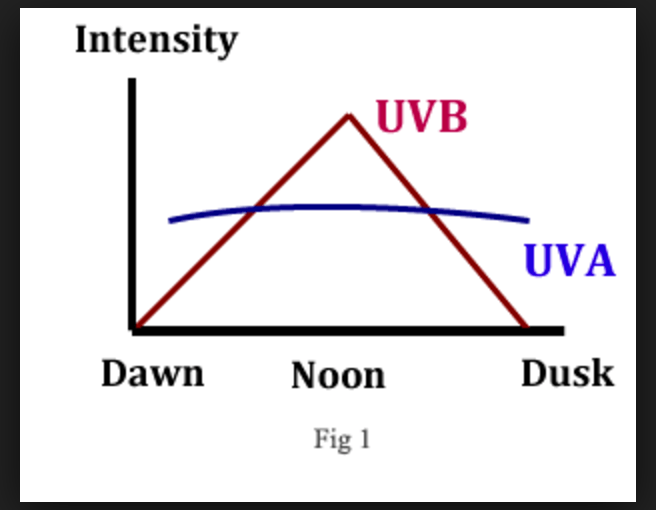 He did not tell me that UVA is constant from sunup to sundown, that it is the more damaging and the more prevalent UV, that the damage is invisible + won’t be seen for 30 years, that UVA bounces + reflects. I’d relayed his disturbing comments about my likely fate to my new dermatologist. She looked horrified. Truth be told, I did wear sunscreen, but back then sunscreens were icky, sticky, greasy, tacky, white and thick. I do have memories of running in road races with white film boiling up out of my pores, running down my arms + staining my workout clothes. I never put SPF on my face or neck; they were not cosmetically appealing. Instead I took to wearing painter’s caps + billed caps to shield my eyes. At other times, like when I was working in the garden, I wore broad brimmed SPF hats. I liked her immediately. But here’s the thing. Why didn’t either of these dermatologists discuss the finer points of UVA + UVB with me, and tell me that I should be wearing a “broad spectrum” SPF every day, rain or shine, summer, winter, spring + fall, because UVA is constant year round from dawn to dusk? That it is UVA that is immuno suppressing + photoaging + DNA damaging + the cause of sagging skin, wrinkling + the primary cause of MELANOMA? Why didn’t they tell me that windows block UVB but that UVA penetrates windows, clothing, clouds + more, and goes deep into skin where it wreaks havoc on keratins + elastins, not to mention deleterious effects on one’s DNA + melanocytes? Why didn’t they tell me that all those burns meant I’d exposed myself to massive doses of the more dangerous UVA rays? Because they didn’t know. No one knew. In fact, I think back then there were no SPFs labeled Broad Spectrum. Even my first dermatologist was much more concerned with my burns. He never talked about UVA + UVB and what the difference was. You know why? Back then, UVB was blamed for everything¹. UVA was ignored! UVA has emerged as the silent, malevolent thief. It is the thief of youth, of collagen + elastin, the thief of firm, plump skin + ultimately, for the fairest among us, the blondes, the freckled + the redheaded, the whitest + most sensitive, it may ultimately be the thief of life itself, when it manifests in melanoma. This graph here clearly illustrates why I should be worried about my many youthful sunburns, as well as all sun exposure. UVB is only 2% of the UV radiation reaching the ground! UVA is 98%. What that means is that if one is out there long enough to burn, one has also received a massive dose of UVA. 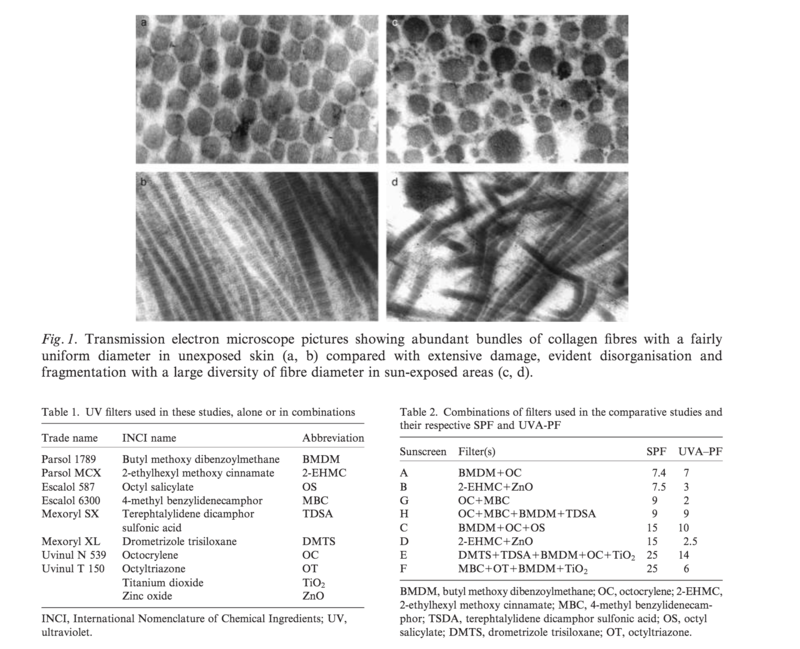 I recently read a devastating scientific study¹ from 2006, where the difference between UVA + UVB is clearly stated, and apparently for the first time, and wherein every known sun filter at the time was tested for UVA efficacy. The conclusions of this study are that the most effective topical sun filters are Mexoryl SX, Mexoryl XL + Avobenzone. The Mexoryl filters are very photo stable and were developed by L’Oreal/La Roche Posay. This brand, and its well known Anthelios sunscreens are recommended by dermatologists. Mexoryl SX + Mexoryl XL were both approved in the E.U. in the early 1990s. Photo stability is another way of saying, does your SPF start to degrade in actual use? The Mexoryls and the more recently E.U. approved BASF developed Tinosorb S are very photo stable. Meaning they do not degrade in direct sunlight. They are collectively labeled under the marketing term Mexoplex. In the United States sunscreen is classified as a drug + heavily regulated by the FDA. Because of this, the U.S. is far behind other parts of the world when it comes to sunscreen. To wit, the FDA has only approved one new sun filter since the early 1970s. In 2006 they approved the use of Mexoryl SX, which is a photo stable UVA 1 and UVA 2 blocker/absorber. The FDA has not approved any other sun filter since 2006. That’s more than a decade ago! It would be swell if they would approve Mexoryl XL + Tinosorb S and allow La Roche Posay to sell their existing EU sunscreens on the shelves of drugstores + supermarkets in the U.S. Many Asian sunscreens contain only Tinosorb S, which blocks UVB + UVA 1 + UVA 2. The Environmental Working Group (EWG) sunscreen recommendations include finding sunscreens that contain Avobenzone (Parsol 1789) or Zinc + to avoid SPFs that contain insect repellent + oxybenzone, the latter of which is environmentally deleterious³. The EWG has an excellent essay about why European sunscreens are much better than those that we have in the U.S. Again, incidentally, 99% of the U.S. versions of Anthelios that you can purchase on Amazon contain Oxybenzone, one drop of which can kill some impossible number of acres of coral in the ocean. i did write to La Roche Posay to complain about that. When they responded, they told me they were reformulating all their U.S. sunscreens to remove Oxybenzone. Yay! The European PPD is the most accurate of these nomenclatures. If you would like to learn more about the meaning of these terms, read this straightforward post on Soko Glam’s Klog. As you can see, Sunscreen E is the winner. It offers the highest UVA protection relative to its UVB SPF number. It is understandable how confusing this is. When you put on your Broad Spectrum SPF 50, don’t you assume you are evenly protected for say, five hours, against both UVB + UVA? No sunscreen in the world today offers equal protection against both UVB + UVA. The best one can do is to seek out international Anthelios sunscreens from La Roche Posay with high PPD numbers, that contain these current three key ingredients: Mexoryl SX, Mexoryl XL + Tinosorb S. There are only a handful of products in the Anthelios line that contain all three filters, but they are the sunscreens with the highest PPD numbers. The sunscreen that I now use is the Anthelios XL Ultra Fluid SPF 50 PPD 42. I believe this is the highest PPD that La Roche Posay offers. These SPF + PPD numbers theoretically mean that the Ultra Fluid can protect against UVB for up to 8 hours, and UVA for up to 7 hours* of constant midday exposure. Yet still, on the international La Roche Posay website, they say that no sunscreen product fully protects against the damaging effects of UVA, and that even if you wear their PPD 42 Ultra Fluid, you should still seek shade, wear a hat + dark clothing (more protection!) and get out of the sun as soon as possible. When I went to the Bennington Garlic Festival in September, I wore an SPF 100 shirt + pants, a SPF 100 hat, and the Ultra Fluid, and still, I was exhausted after 2 hours. The sun drains my energy, even shielding myself from it as I did. I put the Ultra Fluid on three times. Once before I went, once again as soon as I got there + after I had been sweating. I sought out shade. The La Roche Posay language about no sunscreen offering 100% protection is accurate. The sun is not your friend, or at any rate, it’s not my friend. But of course, no one can or wants to live like a mole, hiding in the dark all the time. One has to go to the market for food, for example, and it would be nice to just live our normal lives without having to worry about all of this. “See that window there,” I said to my new (third) dermatologist a few months ago. “No direct beam of light, just general indirect light from outside, right?” I know how crazy I am sounding right about now. “How much UVA is coming in? I still cannot find an answer to this question. Does a beam of light have to be pouring in? Does the sky have to be visible though the window? What about the general indirect light? Does it matter how far the window is from the ground? Winter or summer? (Snow is very reflective. Grass is not.) How much UVA? The windshields of cars block both UVA + UVB, the side and back windows, like all glass, block UVB only. The damage I and other people my age now see on our skin (no one who came of age in the 1970s was being slathered with SPF every day, and in the U.S., the sunscreens back then only protected against UVB anyway) is from years of working near windows, from long commutes in the car, from sunny vacations, from working in the garden, for myself from 50 odd years of randomly accumulated UVA damage, burns or not. Even after I got smart enough to avoid the burn, I still had so much to learn. As late as last winter, I was outside snowshoeing with no SPF on my face and certainly not a wide brimmed hat. I wore a North Face beanie. It was winter, and I believed the sources that said UV is less in the winter, which was a half truth. UVB is weaker in winter. I did not burn, but I know now that UVA is constant year round and reflects nearly perfectly off the snow. Much less perfectly off grass. I probably got more UVA damage during my winters of snowshoeing than I did bent over weeds in the garden in summer. In the past six months I have researched dozens of sources. I will continue to dig into this, sharing any new information I find, for I realize that not everyone shares my zeal for research. I do not mean to sound alarmist about all of this. There are a lot of people who believe the sun is good for them. I guess if you are olive or darker skinned, and if you are male you have less to worry about. I read just recently yet another study that showed that most of the deep skin UVA damage occurs when you come inside from the sun, over the next 24 hours, which means for the future that manufacturers could develop topical agents to halt the damage from UVA after you’ve been exposed. How great would that be, to have a night cream that undid all the unseen damage done to your face during the day. You know if you got a lot of sunburns you got a lot of sun (UVB + UVA). The burn damage was healed long ago. It’s the UVA you couldn’t see. The UVA hitting you on the beach, on your lunch hour, in your car, in your home, all the time, from sun up to sun down, all day long, all year long, for your entire life. My best advice is to seek out the La Roche Posay Anthelios sunscreens that contain all three photo stable filters: Mexoryl SX, Mexoryl XL + Tinosorb S. These sunscreens offer the highest, broadest, most complete UVB/UVA protection in the world. Keep an eye on the ingredient list, as well, since La Roche Posay sometimes changes the formulation. For instance, even the SPF 50 Ultra Fluid is newly formulated with Tinosorb S, but the SPF 50 Lait recently dropped the Tinosorb S. You can find some of these products on eBay, but inquire about the ingredients + the expiry dates. For example, I purchased a 300ml tube of the SPF 50 Lait on eBay as well as two 250ml tubes of it. The 300ml has the Tinosorb S. The 250ml tubes were newer, and did not have the Tinosorb S.
It is sad that we have to be so vigilant. Our understanding of UVA is still developing, so for now, we need to do the best we can and find our own trusted information. I hope I have given you a good start here, and something to think about. ¹ Protection of skin biological targets by different types of sunscreens. A. Fourtanier, F. Bernerd, C. Bouillon, L. Marrot, D. Moyal, S. Seite´L’Oreal Recherche, Clichy Cedex, France. Photodermatology, Photoimmunology & Photomedicine. ² Photostable: All SPF starts breaking down in direct light. Learn more about photostability from Skinacea.com here. Does Europe have better sunscreens? The Environmental Working Group.